*NOTE: Outfit and Accessories fit Dora Links Doll and other approx. *Box has some small inward bend near bottom, and modest creases at top. For Box Condition see CONDITION NOTE or Email Seller for Details. COMPUTER SPECIFICATIONS and MINIMUM SYSTEM REQUIREMENTS: Windows XP (SP3) , or Windows Vista Operating System, 1 (GHz) Pentium 3 Processor, 256MB of Technique Ram, Video Adapter and Monitor with - Super VGA (800 x 600) or Higher and 8MB Video RAM, 1GB of Free Hard Disk Space, High Speed Internet Access (Minimum 768kbps) , USB V1. 1 or Higher, CD-Rom Drive, Speakers, Keyboard and Mouse (NOT included ). Computer NOT included. 13"Dora Links Explorer Girls Dolls. For Ages 5+ Years. 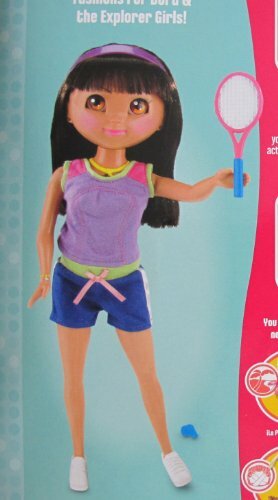 IF YOU OWN the DORA LINKS DOLL, you can UN-LOCK the Soccer Activity On-Line and you can check out the New Fashions and Shop for New Fashions. YOU can also Play with JUST the Sports Styles ON-LINE by entering the Secret Code (supplied in Box ). All sizes and details are offered to the best of my ability and may not be exact and could vary. 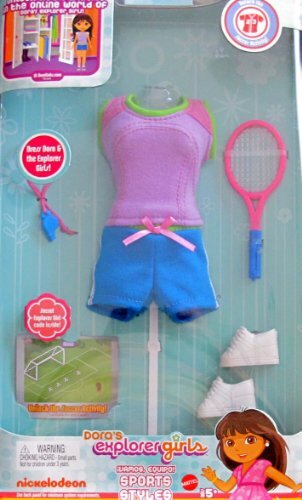 INCLUDES: Pair of blue Shorts w/white and purple stripes down outer sides, purple Top w/green neckline, Pair of white Sports Shoes, pink Tennis Racket w/blue handle, a blue Whistle w/pink Neck Strap, and Secret Explorer Girl CODE to UN-LOCK the Soccer Activity on YOUR computer! (Computer NOT included). Outfit and Accessories fit Dora Links and other approx. 13" Dora Links Explorer Girls Dolls. All sizes, colors and details may not be exact and may vary. 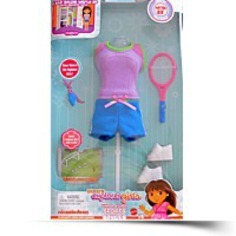 Dora's Explorer Girls Sports Styles - Unlock Soccer Activity! is a 2009 Viacom/Nickelodeon, Mattel production. Dress Dora and The Explorer Girls and UN-LOCK the Secret SOCCER Activity Code On-Line to reveal New Fashions and Fun Games. * NOTE: See Below in Product Description. For ages 5+ Years. For Box Condition see CONDITION NOTE or Email Seller for Details. 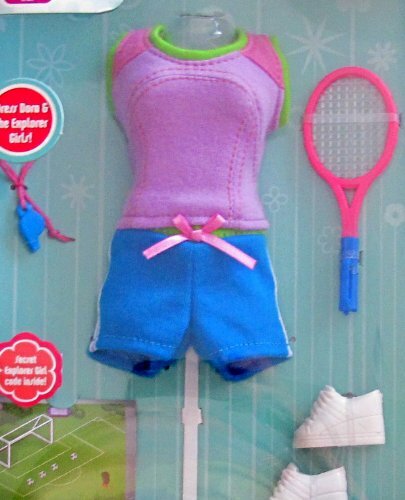 Size: Fashions & accessories fit Dora Links & other 13" Dora Links Dolls; NO DOLLS included. All sizes are approximate & may vary. Package Dim. : Height: 1.5" Length: 11.2" Depth: 6.9"